Some of you may remember I have written about panzanella before. 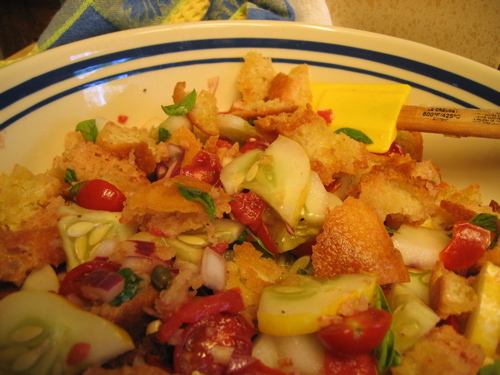 Panzanella is an Italian style salad featuring leftover bread and fresh tomatoes. It is the epitome of a late-summer salad that typically makes use of chopped, fresh tomatoes tossed with home made croutons. So why do I mention it now, in November when the weather is cold? Today is the day after Thanksgiving, and after the heavy meal we enjoyed last night, I am craving a healthy lunch that features vegetables. So I grabbed a can of chopped tomatoes and pretended it was summer. If you are looking for a great way to use leftover turkey, look no further. To make this salad, cut some left over crusty french bread into cubes, and toast them in a hot pan on the stove top in some olive oil and minced garlic. Toss them into a large bowl with some green lettuce ripped into bite size pieces. Now add whatever fresh vegetables you have on hand. I chopped and added some green onions, leftover cooked green beans, sliced celery, and some chunks of diced canned tomatoes (without the juice). I also added some pieces of hard salamie and peperoni. Finally, chop and add pieces of left over turkey breast meat. Over all this, drizzle a little fresh vinaigrette. You will hardly know you are eating Thanksgiving leftovers for lunch. PS: My friend Elise at Simply Recipes tells you how to make your own croutons here. 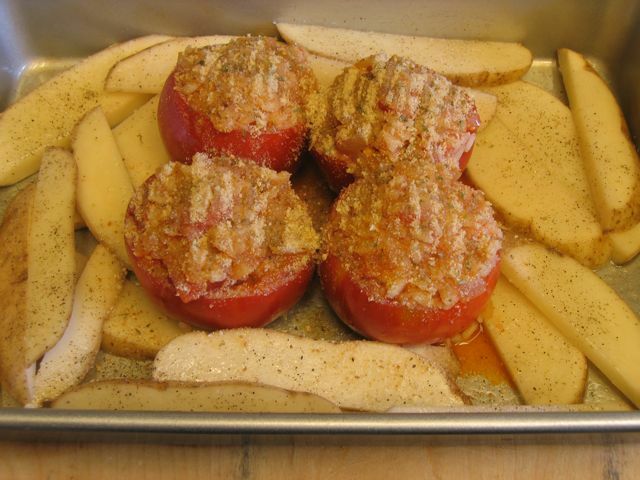 Here's what I love about the Series of Tubes Known as the Internets: You have the Last Hurrah of summer's tomatoes on your kitchen counter, and someone-- in this case, the lovely Molly on her food blog Orangette-- posts a stuffed tomato recipe that even a rookie can cook. 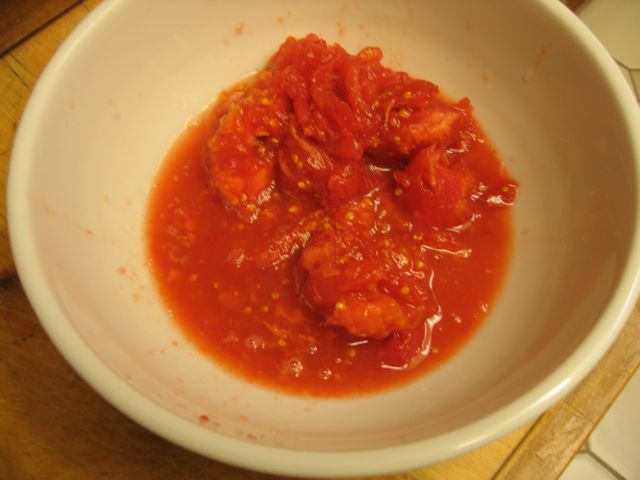 Here is a recipe that uses delicious, meaty tomatoes to good advantage, squandering neither their rich hearty flavor nor their firm pulpy texture. You will need: Four ripe fresh tomatoes, 1/3 cup Arborio rice, 1/3 cup water, a small yellow onion, a few leaves of fresh basil, two potatoes (optional), olive oil and salt. Chop the pulp into bits, right there in the bowl. Meanwhile, chop and saute the onions until translucent, then add the 1/3 cup Arborio rice and let it cook a couple of minutes. (NOTE: You really do want Arborio rice if at all possible, as it will take on a fabulous creamy texture to the finished product). Then add the tomato pulp, 1/3 cup water, salt and chopped basil. Reduce the heat and cover the pot, letting it simmer about ten minutes. This is to "par-boil" the rice, which is a fancy way of saying that you are not cooking it completely, only starting the process which will finish later in the oven. This is also a good time to pre-heat your oven to 350 degree F.
Arrange your empty tomatoes on a 9 x 13 baking pan that has been oiled. Take two baking potatoes and cut them into 1/4 inch thick wedges. Toss these very lightly in oil and season with salt and pepper. 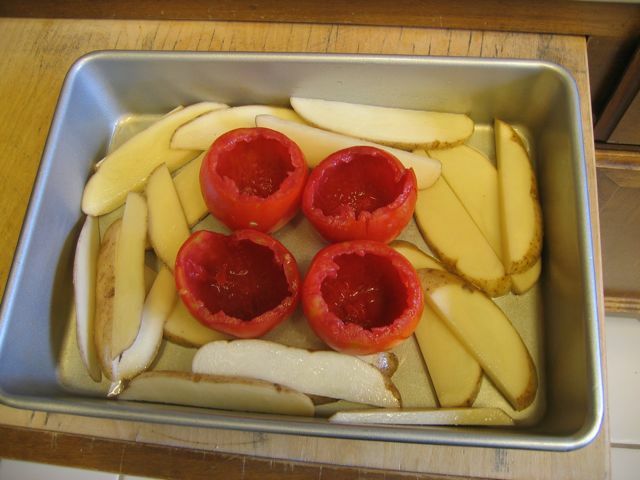 Then surround the tomatoes with the potatoe wedges, which also serve to support the tomatoes in the pan. 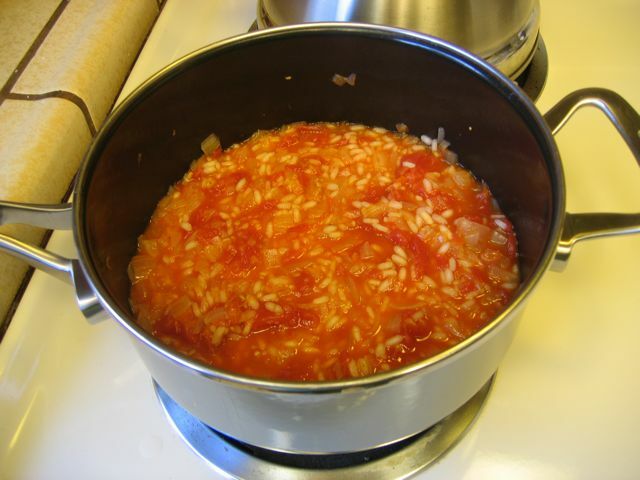 Now, using a large spoon, you can carefully fill the tomatoes with the rice and onion mixture. Do not over-pack it tightly, but be generous. Then sprinkle bread crumbs over the top and drizzle with olive oil. Bake the whole shebang in a 350 degree F. oven for an hour and fifteen minutes. Let it cool about fifteen minutes before serving. I have no picture of the finished product, because these beauties vanished as quickly as the warm memory of summer. This dish was an unmitigated success, and will no doubt become a staple in our home. 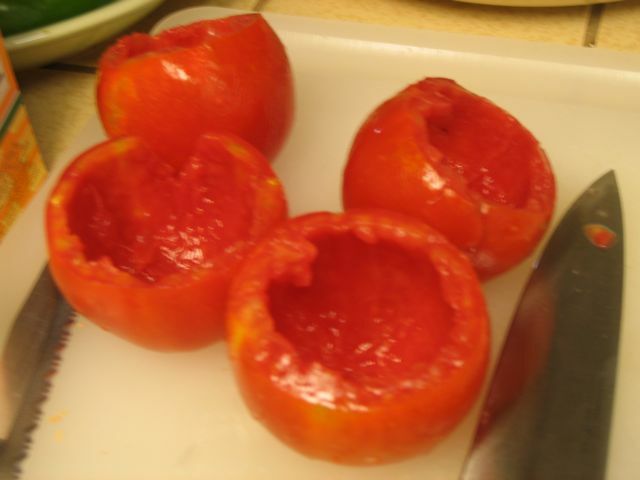 And oh, it pains me I didn't learn this recipe at the beginning of tomato season rather than at the end! I'd like to say these heirloom tomatoes came from my own garden, but our plants are not ready for harvest, and I have no qualms about buying these golden orange beauties. Lightly dressed with olive oil, salt and pepper... (sigh). So good. We got a late start on the garden this year, and Nature is a cruel Mistress; there are no hall passes or tardy slips that will give me back those early summer weeks when I should have been out there in the yard planting seeds or setting out young plants. In fact I have a confession: the cherry tomatoes that are growing now are volunteers from last year! Several little tomato seeds got it in their little round heads to sow themselves. And despite my "square foot gardening" plan, all neatly drawn out in grids on my paper, we could not bear to pull out these upstarts. So while the Plan is not completely shot to hell, it is... well let's just say it's more of a "wavy foot garden", not quite as geometric as I had planned. But that's OK. I did pull out ("thinning" after the fact) the plants that were too close together, and then I cut off the excess limbs so as to strengthen and train the best vine of the plant onto a rudimentary structure. The idea is to grow the vines vertically in order to increase yield, and conserve water and space and work. In the next few days (after the New Moon) I'll be planting the other veggies and herbs, trying to fit them around the tomatoes and in some kind of relaxed grid. I'll explain these grids later for those of you new to the idea of "square foot gardening". 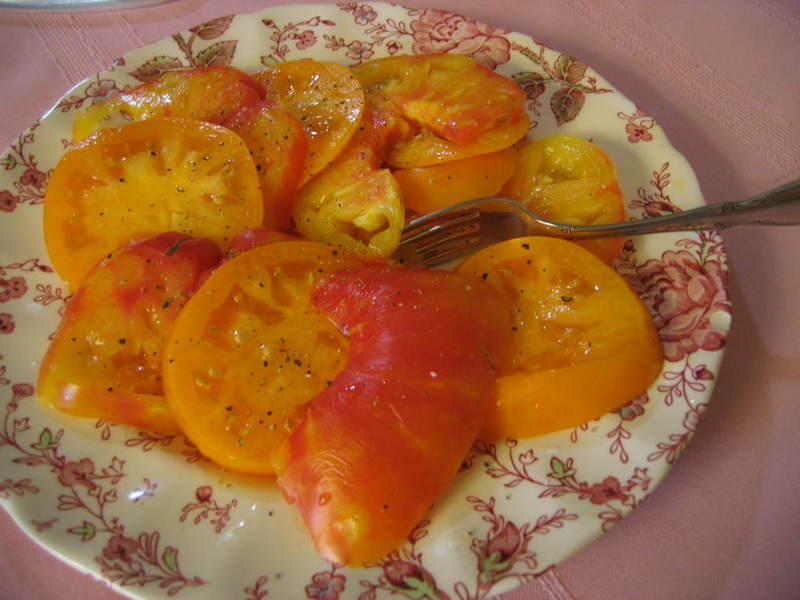 For now I am just glad to get to the garden and eat a few heirloom tomatoes from the market to keep me inspired. One of the best things I ever did was buy a cast iron grill pan at a local thrift shop. It allows me to grill indoors, all year long. 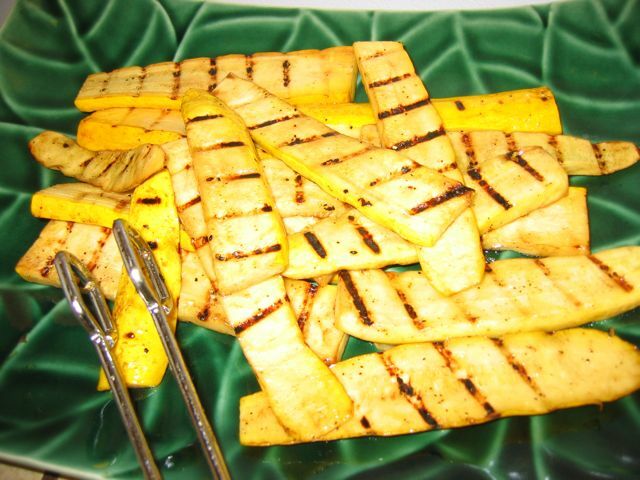 I love the way it adds grill marks and texture to vegetables, meats, and even firm fleshed fruits. I let the pan heat up for a few minutes on the stove top while I slice my vegetables and give them a very light coating of olive or vegetable oil. then a sprinkle of kosher salt and fresh cracked pepper. Then it's off to the grill for a few minutes on each side. The veggies are good by themselves hot off the grill, or they make good leftovers, cut up into a cold salad or reheated with pasta, in a soup.... you know the drill. Good stuff. My standard treatment to relieve a sore throat used to be a gargle with water and apple cider vinegar. It tasted icky but took most of the soreness out. Usually. But I have found something WAY better and 100 percent effective. I think it tastes good too. 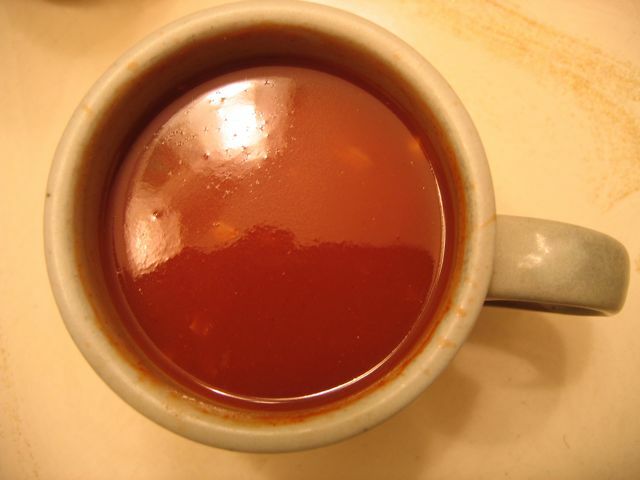 It's called Tomato Tea, or Cayenne Pepper Tea. This concoction uses a HUGE amount of cayenne pepper to, essentially, "nuke" and numb out the inflamed tissues of your throat. It absolutely works, and FAST. Does the cayenne pepper burn your mouth? Well, kind of. Your lips will buzz for awhile, and as you drink it you will think to yourself, "Am I drinking a soup of very angry bees that are stinging my mouth?" I won't lie to you, it does feel that way, but I kid you not, the buzzing lips go away and so does the sore throat pain. Sweet relief! I think the tea (which is really more of a soup) has other curative powers and speeds recovery from the illness by killing off the virus. I am one of those who actually enjoys the taste of this beverage. I find it quite soothing. It includes a healthy dose of garlic which is also known to have anti-viral effects. Oh and anti-vampire as well. Place all ingredients in a saucepan and heat through to hot soup drinkable temperature. SIP the concoction, inhaling the fragrance of the garlic. Enjoy the feeling of the pepper as it "burns away" the pain, numbing it out and killing the virus! This will likely clear you sinuses too. If you only have cayenne pepper on hand, you can make a simple gargle of a cup of water and a teaspoon of cayenne pepper (or as much as you can stand). Stir the water to keep the pepper afloat while you gargle with it a few times. Not nearly as pleasnat or tasty, but effective in removing the pain. The first time I used this cure was last spring, when I had the worst sore throat I had experienced in years. The Vinegar and water gargle didn't touch it. In desperation I searched the net and ran across this recipe. I tried it and it worked so well, it is now my treatment of choice. The cayenne pepper soup may cure it in one dose, possibly another one a few hours later if the sore throat is severe, but in my experience this is a miracle cure and even tasty once you get used to it. There's something that feels vaguely decadent to me about using food for merely decorative purposes. Food is beautiful, yes, but there ought to be a word--foodism?-- to describe the objectivism of food, as if it were an object to be ogled instead of consumed. But then again, the Creator did make it beautiful, so why not celebrate that fact? If we can enjoy a still life of fruit in a painting, why not in a glass bowl? 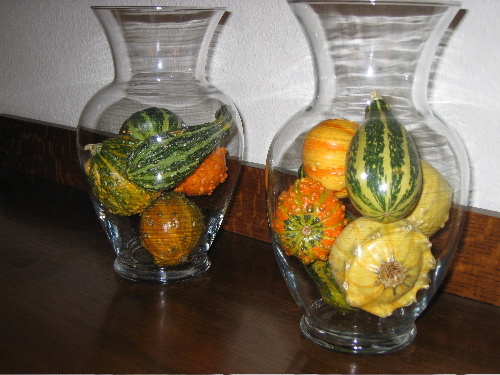 I think these squash are lovely to behold. They herald the crisp days of autumn. These won't be eaten, but I draw the line at plastic or "wax" fruit. Battle of the Beans: It's on! As if to prove my point about Mark Bittman's straightforward and yet inspiring ways with food, his post yesterday featured that summer staple, bean salads. Not being content to give just one recipe, he does a wonderful "theme and variations" post on bean salad Indian style, French style, Greek style (in the printed recipe area), Japanese style, and Texas style. The diffferent bean colors, herbs and condiments makes for a world tour of flavors that demonstrates why I enjoy learning from Mr. Bittman so much. Since our older son Evan has been exploring Veganism, I have shared several recipes with him that feature garbanzo beans. I hope to share them here soon, but in the mean time you can get a sneak preview by reading Evan's fine and entertaining article, Battle of the Beans. Did you read it? Good. So tell me: What is YOUR vote for the best bean of all beans? Let me know in the comment section by the fourth of July and I'll post links to your bean recipes if you have one to share on your blog. Let the battle of the beans begin. I have been on a pea salad kick lately. Truth be told, I made this with frozen peas, and didn't even blanch them in hot water. I simply ran some cool water over the cold peas to thaw them, then ever so gently rolled them lightly over a towel to dry them of excess moisture. In a separate bowl, I mix a quarter cup or so of mayonnaise with a splash of red wine vinegar, a couple of teaspoons of mustard, salt and pepper. Then I roughly chop up a couple of green onions and toss them in the dressing too. 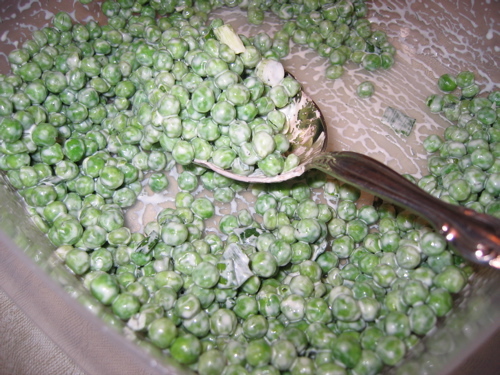 Coat the peas with the dressing, and if there is time, chill the salad in the fridge for half an hour or so. Delicious! This is basically the same dressing I use on mashed potatoes. I like it on the tart side (more vinegar). I love pea salad any time of the year but it is especially welcome when the weather is hot and the peas are fresh rather than frozen. Mark Bittman, (my latest culinary crush), profiles a pea salad recipe in this week's New York Times online Minimalist article. His features the addition of cold, cooked crab and peppers, thus elevating it to a simple but fabulous summer meal rather than just a "side" salad. I'm sure I'll be trying one of his variations soon, because the temperatures here in the California valley are starting to climb into the nineties! Corned beef and cabbage is not, strictly speaking, a traditiionally Irish meal. But that didn't stop me from revisiting this menu for tonight's St. Patrick's Day dinner. This time, instead of making colcannon, I simply went with plain old mashed potatoes. I made extra so I can try my hand at making gnocchi later this week. The one thing I did differently was making braised, rather than boiled, cabbage to accompany the beef and mash. It was surprisingly simple and tasty. The recipe is based on one in American Cookery by James Beard. Wash, remove the core and outer leaves, and slice the cabbage into ribbons. In a large saute pan, melt a tablespoon or two of butter. Lightly saute the cabbage, keeping it crispy. Pour in about a half cup of white wine, and cover the pan. Braise in the liquid about five minutes. When the cabbage is cooked to tenderness, serve immediately. NOTE: James Beard says that over cooking cabbage is what makes it smell bad or get mushy. So keep an eye on it and you will be rewarded with very tasty cabbage. I love scouring used book stores for interesting old cook books to add to my collection. Recently I found a 1976 edition of "The Classic Italian Cook Book; The Art of Italian Cooking and the Italian Art of Eating" by Marcella Hazan. Turns out I am not the only one to appreciate this classic, as it has just been reprinted and rediscovered after 30 + years, under the title of "Essentials of Classic Italian Cooking". Did someone ditch their old copy in favor of the new edition? If so, I am the happier for it. This book is a treasure trove of authentic Italian cuisine. In her book, Marcella shares this panzanella recipe, which she calls "the poor man's dinner in parts of Tuscany and Rome". She says that in the original version, two and three day old bread was soaked in water, squeezed out, and added to the rest of the salad ingredients. However, she prefers the method of cutting the bread into cubes and pan frying it in olive oil to a crispy texture before tossing the bread with the veggies. Tyler Florence knows a good thing when he sees it (which is one of the reasons I enjoy learning from him). In his beautifully photographed Eat This Book; Cooking With Global Fresh Flavors, he shares a very similar panzanella recipe from an "old, out of print Italian cook book". I think he must have been looking at Marcella's book for his source. In his version, instead of frying the bread cubes, he has you moisten the bread with olive oil and then toast them in the oven. I like that method, and will include it in the directions below. The rest of the recipe is Marcella's. If you tried the tuna pan bagnat recipe, here's a tasty way to use up any leftover bread. Tear the bread into bite size pieces (or cut into cubes), toss with olive oil to moisten. Spread the bread on a cookie sheet and lightly toast in the oven. Remove and set aside. Mash the garlic, anchovies and capers to a pulp. (Use a mortar and pestle, or the flat blade of a wide knife on your cutting board). Put this into a large work bowl. Add the seasonings, olive oil, vinegar, and blend thoroughly. Now add the toasted bread, all the vegetables, and toss gently to coat in the dressing. Taste and correct seasonings. This salad makes a fabulous dinner or antipasto. Serve chilled or at room temperature.